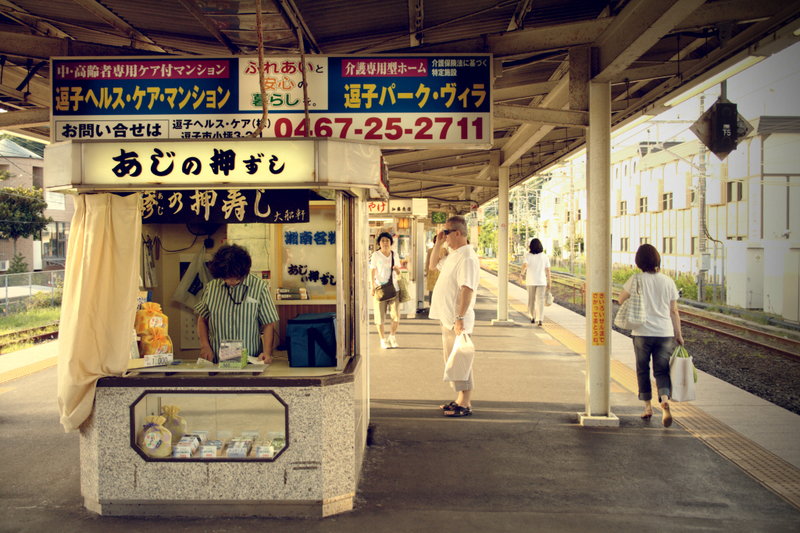 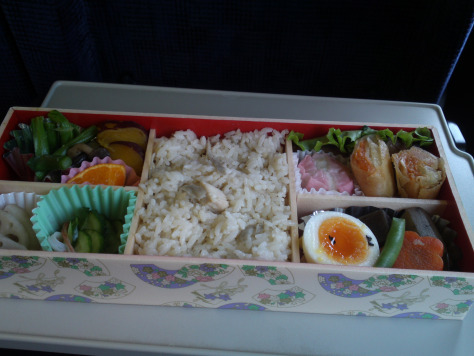 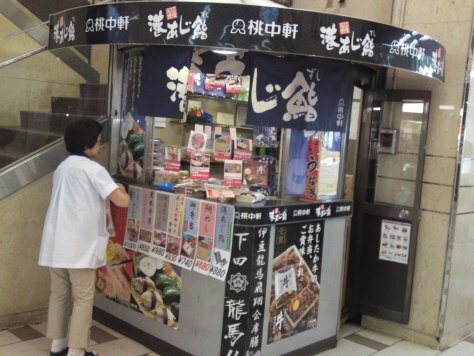 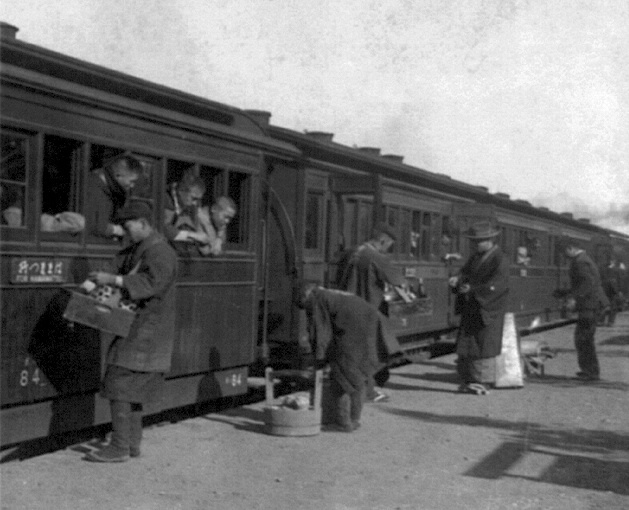 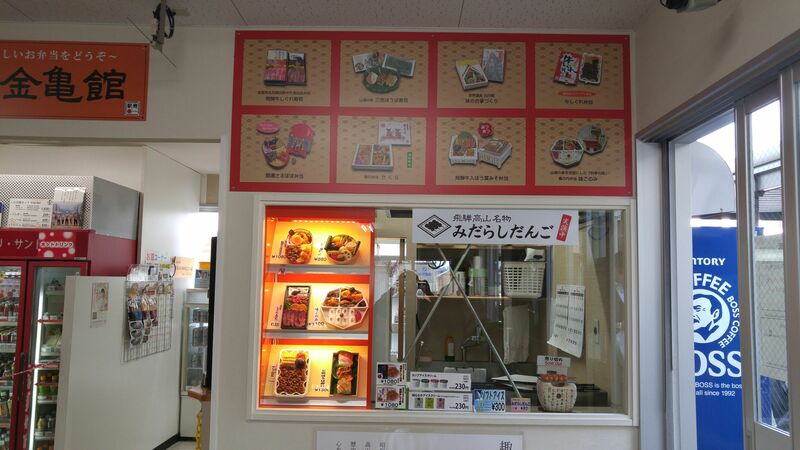 Ekiben is almost as old as railroads and railways in Japan adn have been , wirh high and lows, a feature at important stations all over the country. 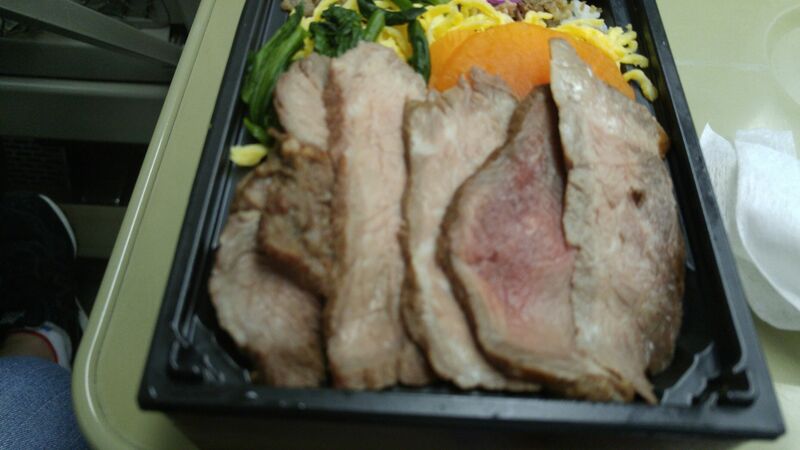 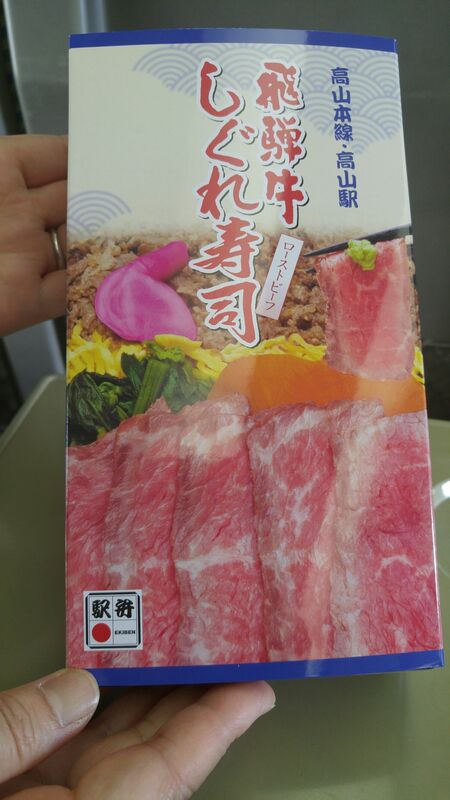 Hamamatsu Mikkabi Beef Ekiben in KakegawaStation! 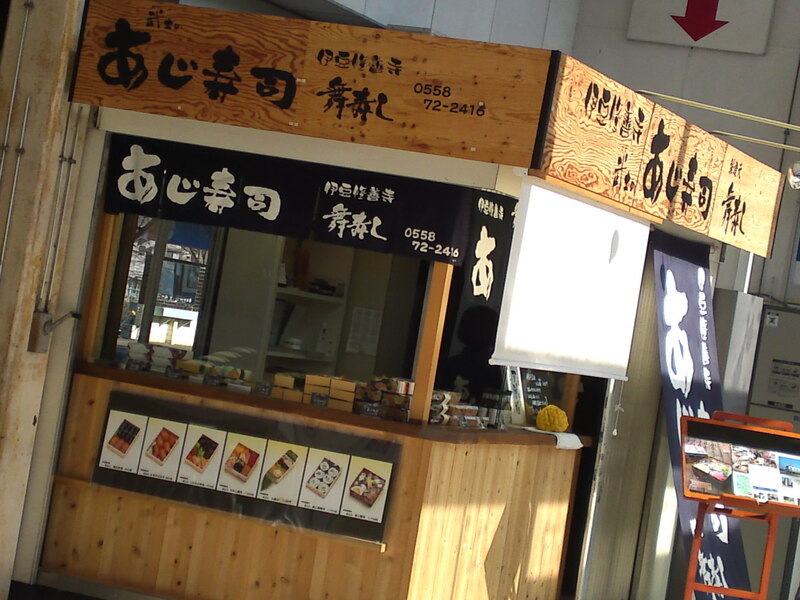 If one day you have the chance to get down at Shuzenji Station in the middle of Izu Peninsula, do not forget to visit this stand selleing “Aji Sushi/Horese Mackerel Sushi” with real wasabi! 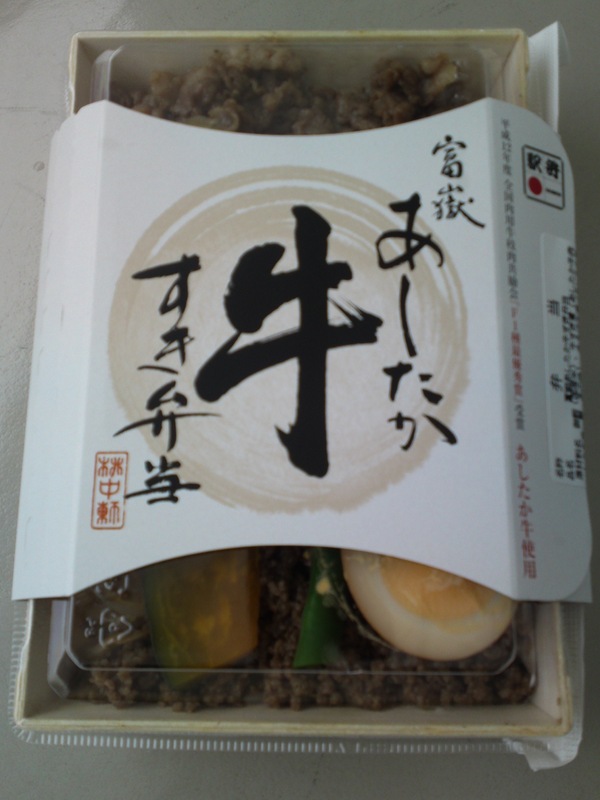 Kazutoyo Gozen/一豊御膳 refers to Kazutoyo Yamauchi, a Lord that lived in Kakegawa City during the Feudal Japan Era in the 16th Century and made famous in a TV Drama Series, while Gozen means “Repast”! 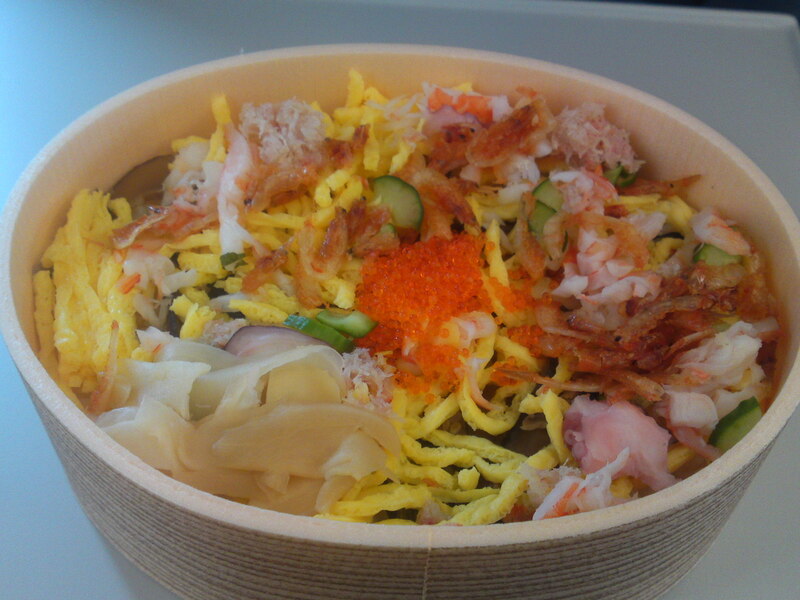 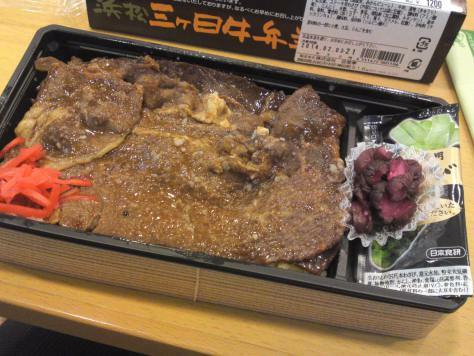 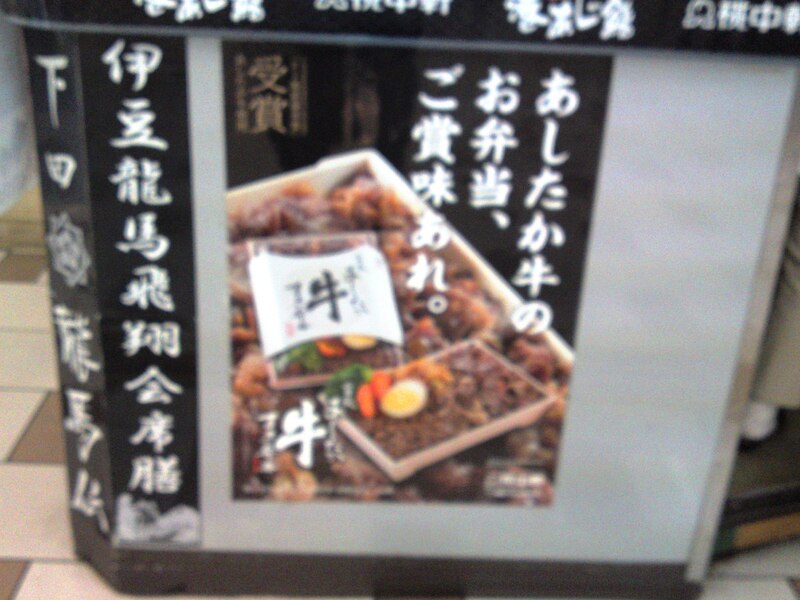 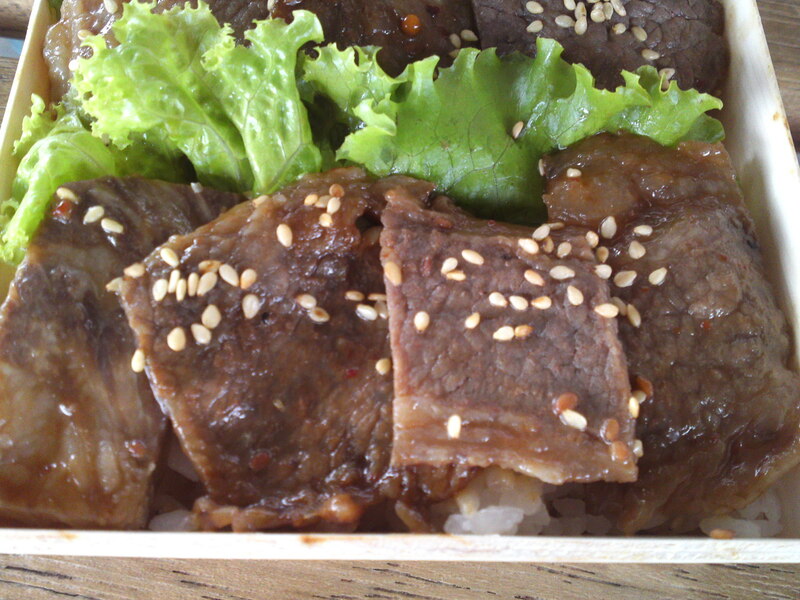 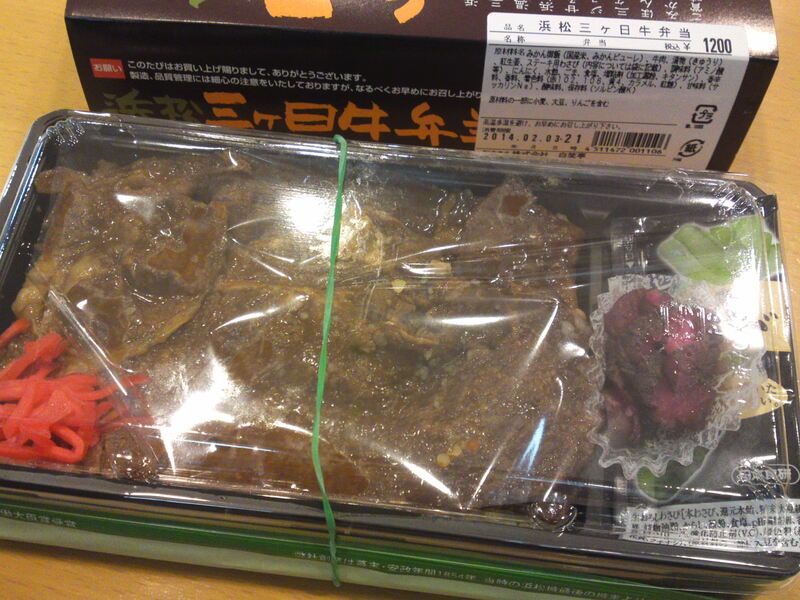 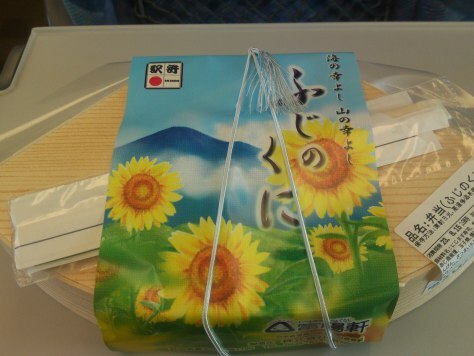 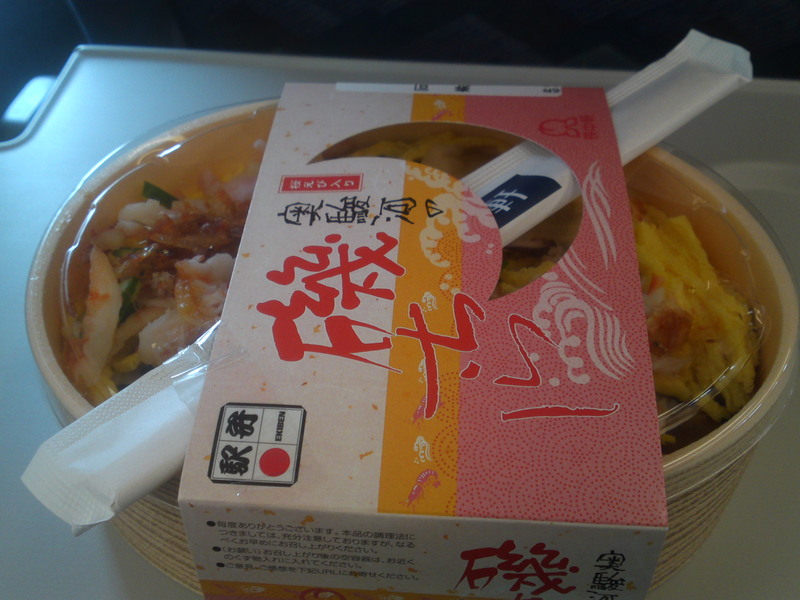 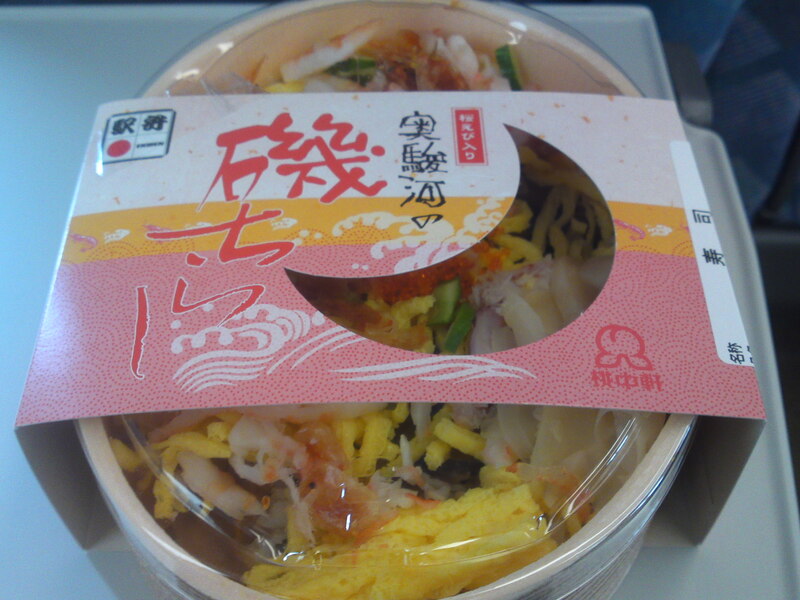 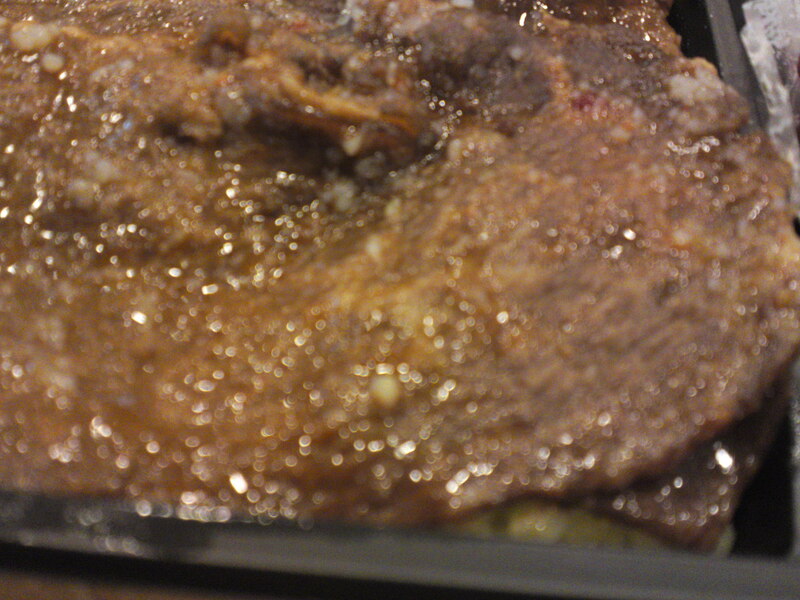 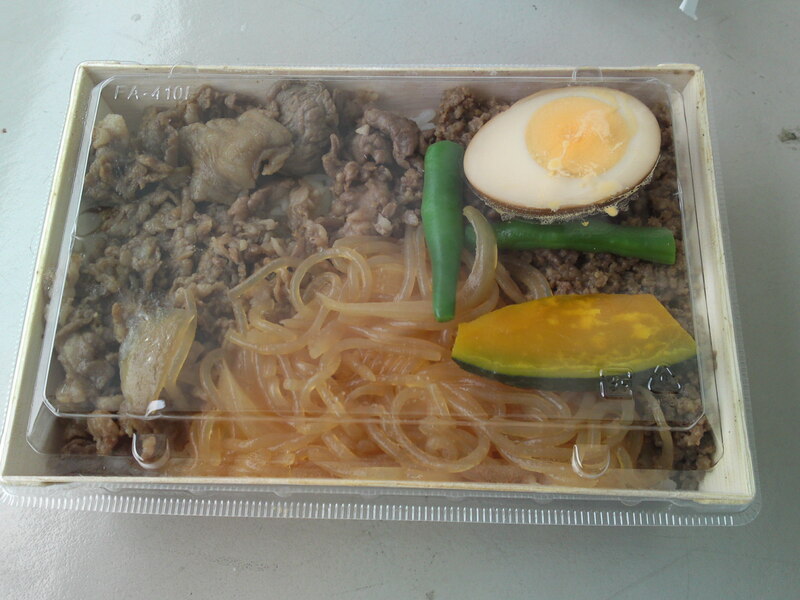 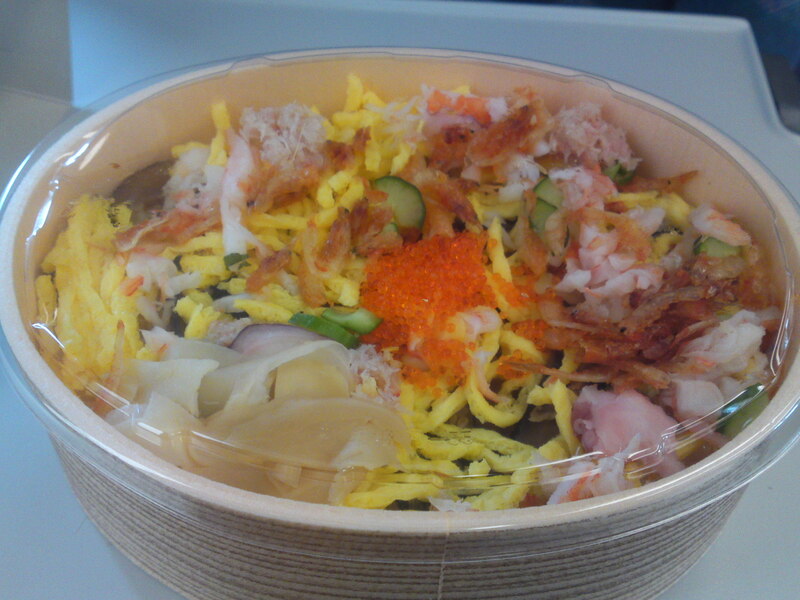 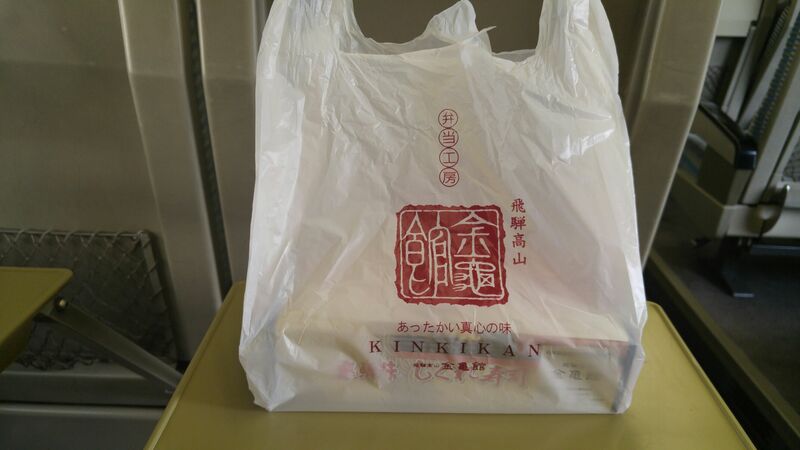 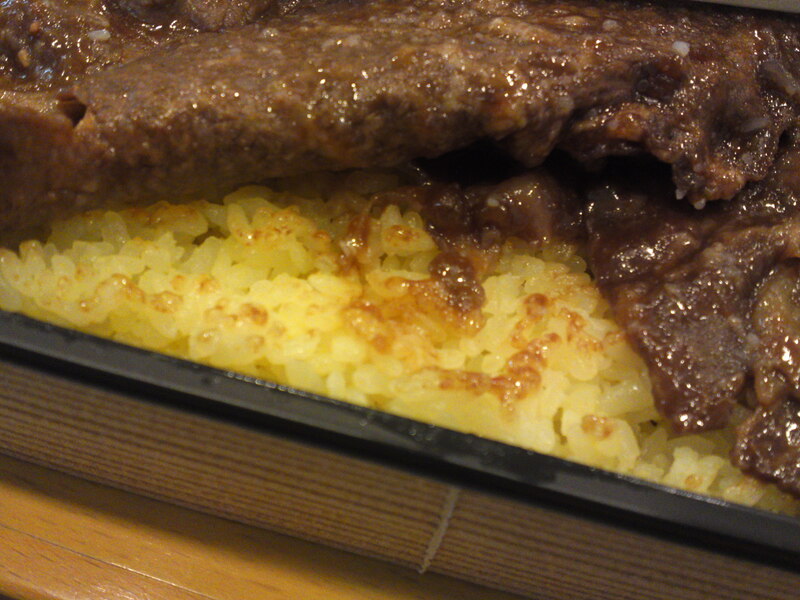 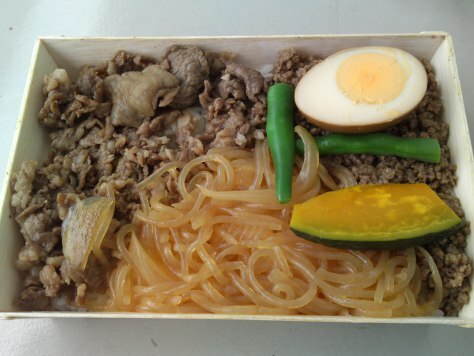 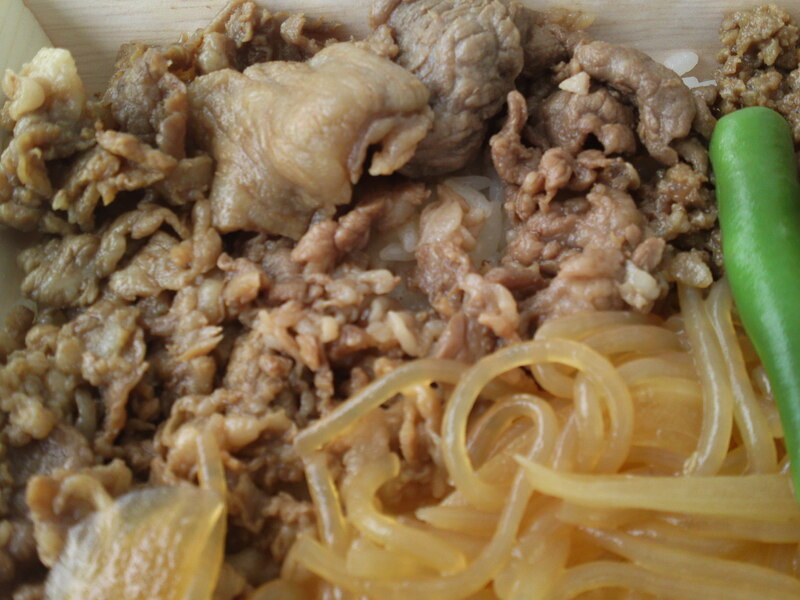 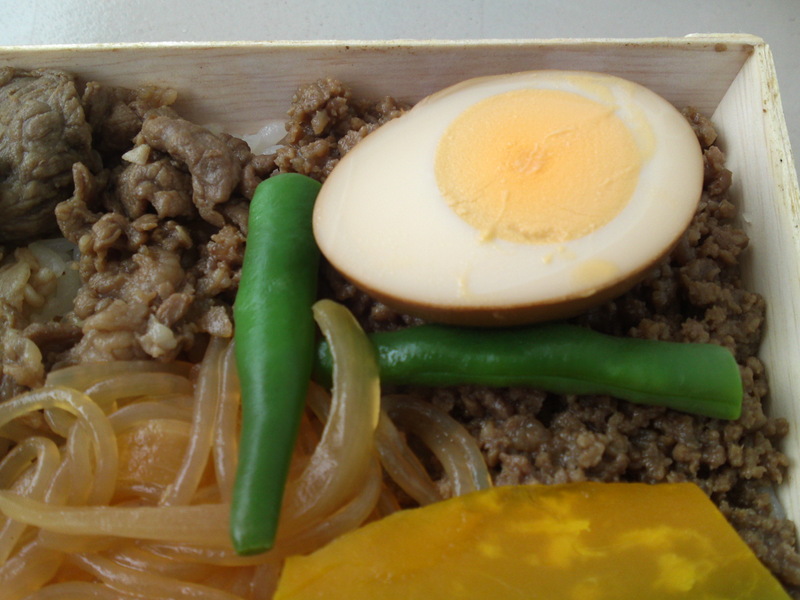 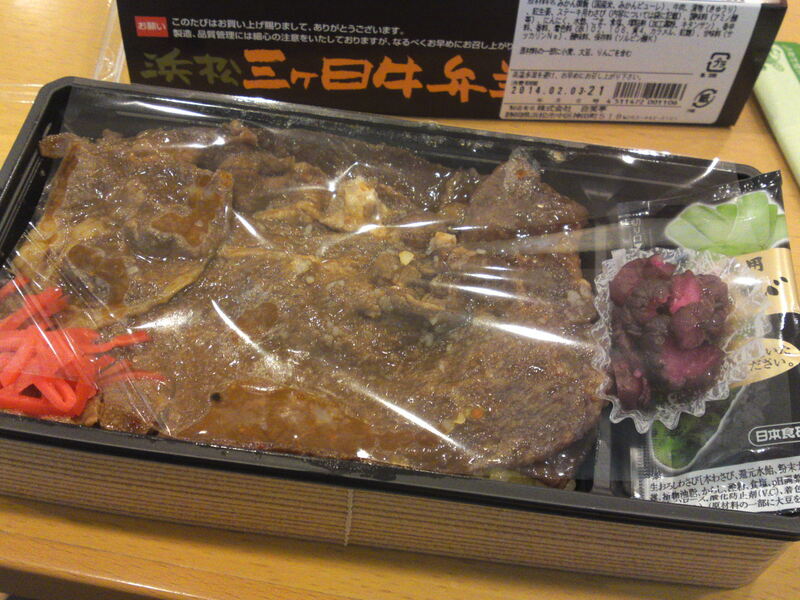 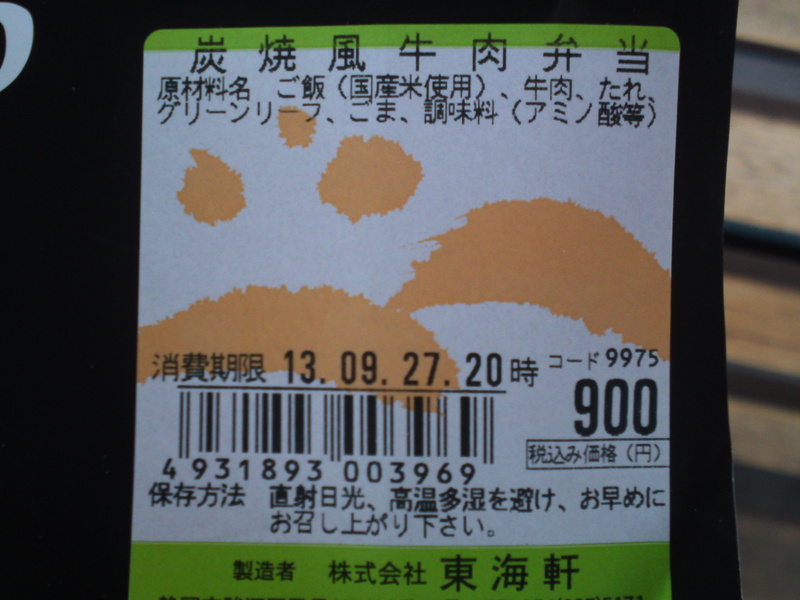 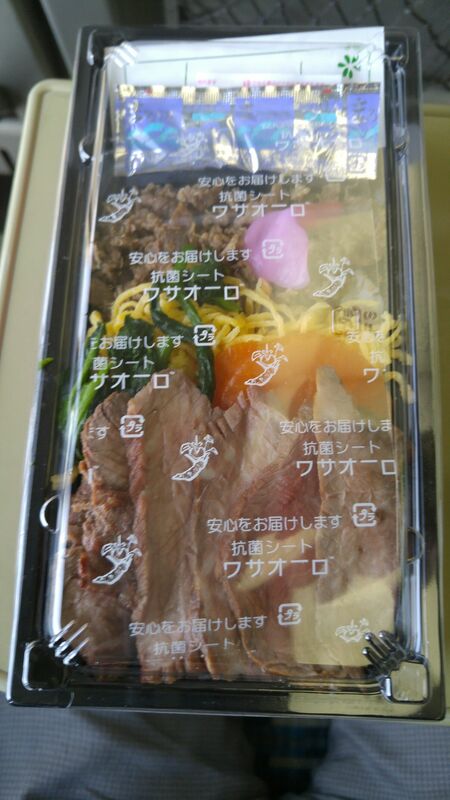 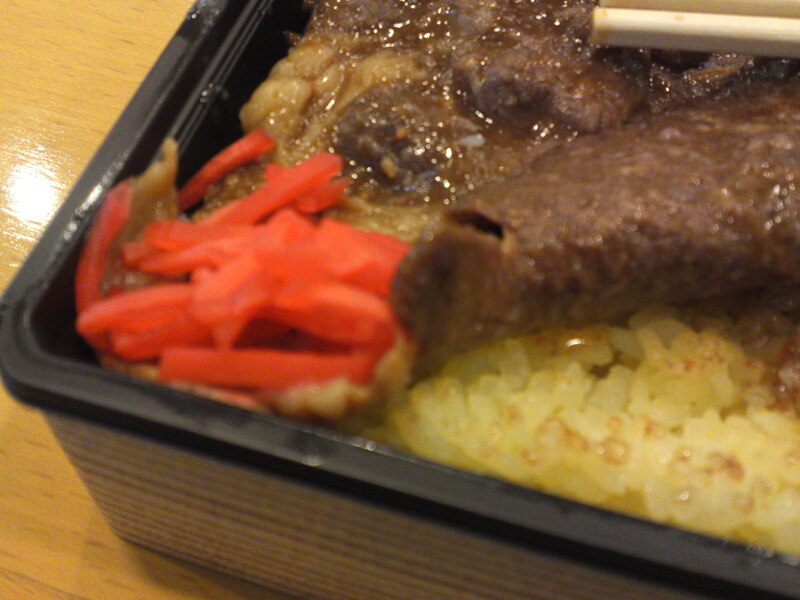 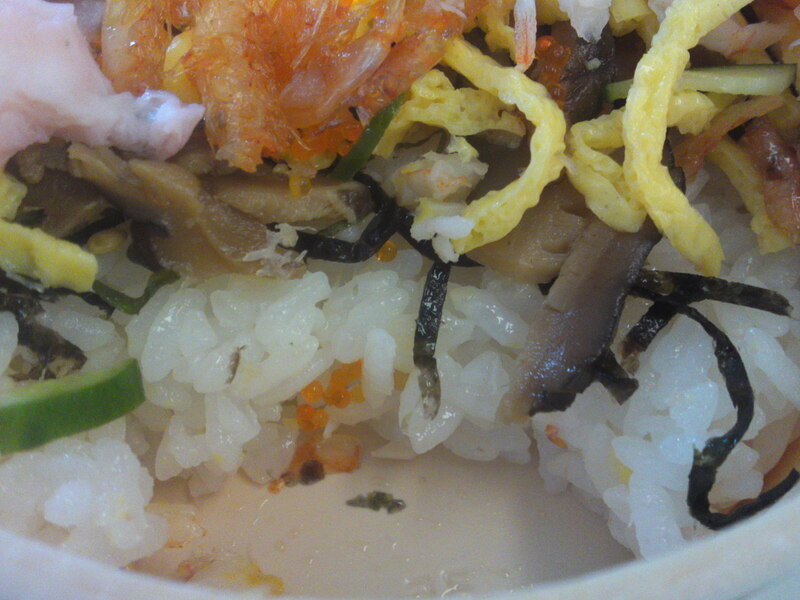 I bought this ekiben inside the Kakegawa JR Station on my way to work! 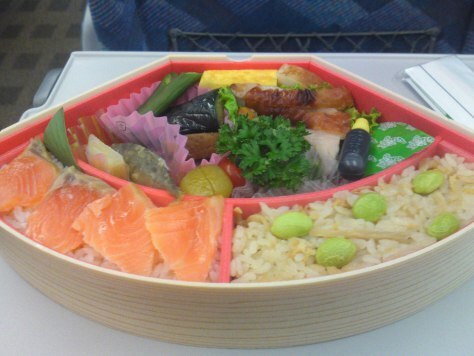 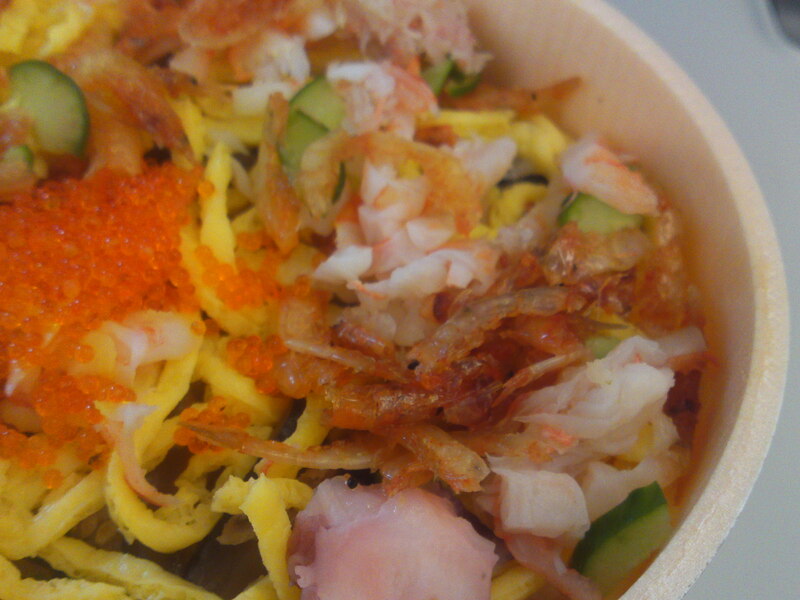 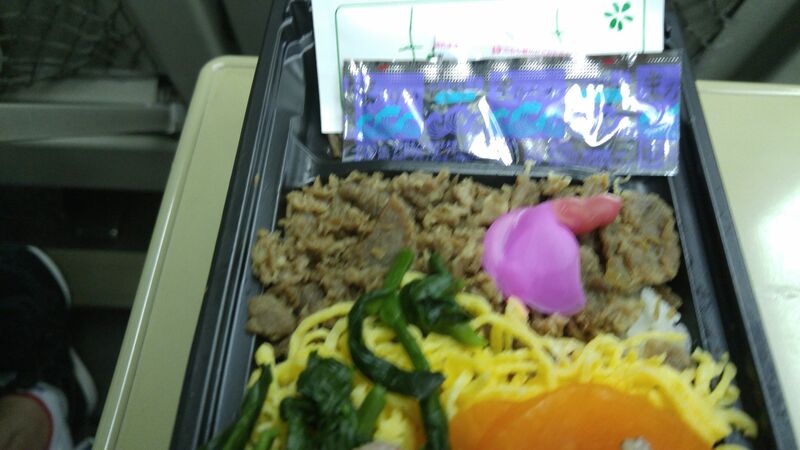 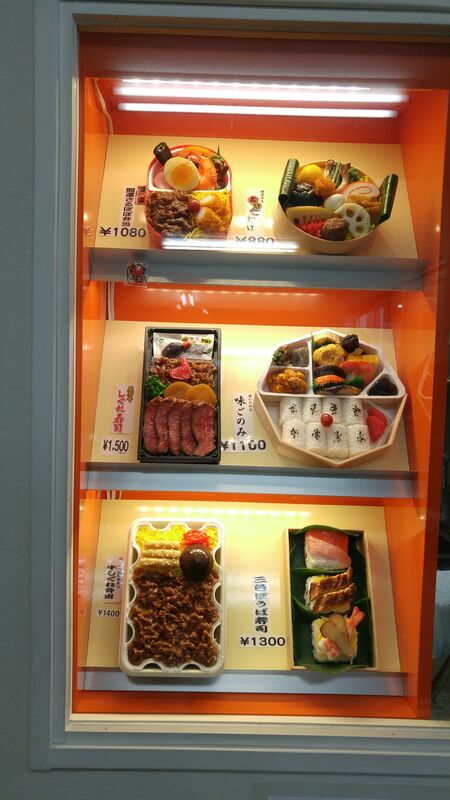 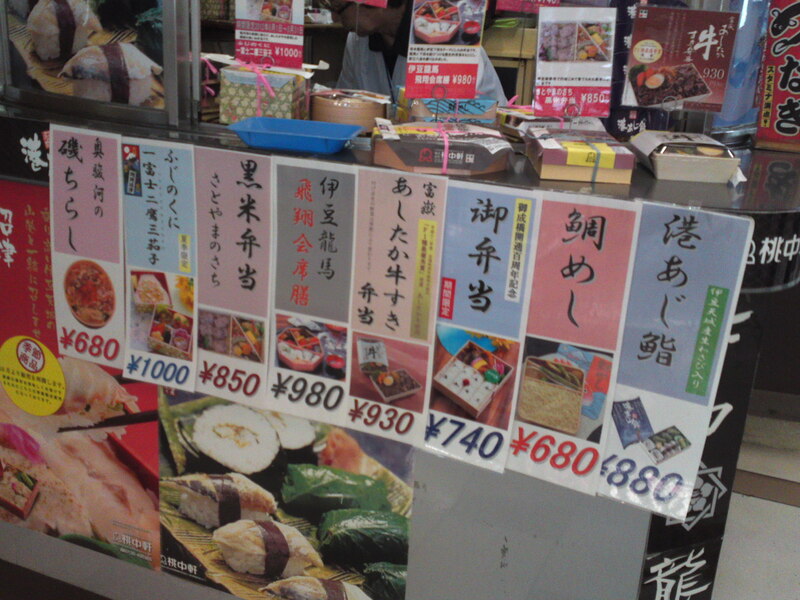 The whole ekiben could have made for a real present to take home! 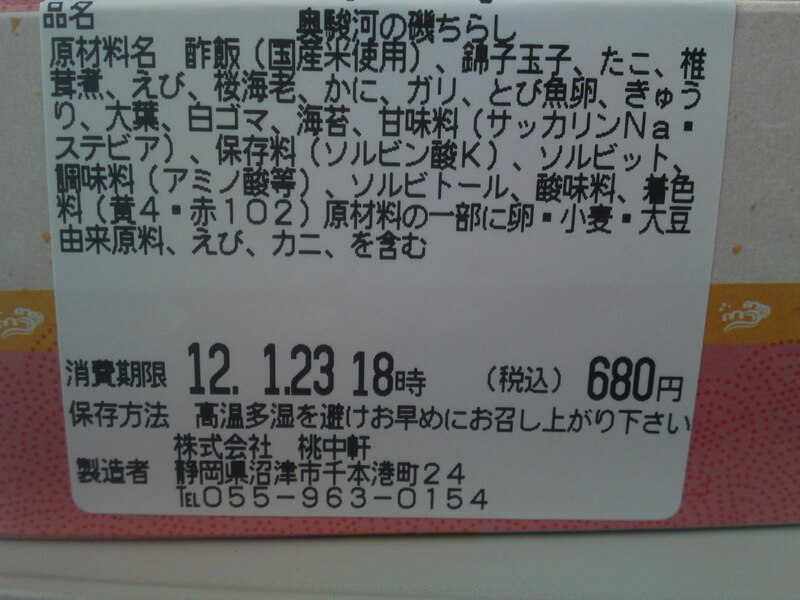 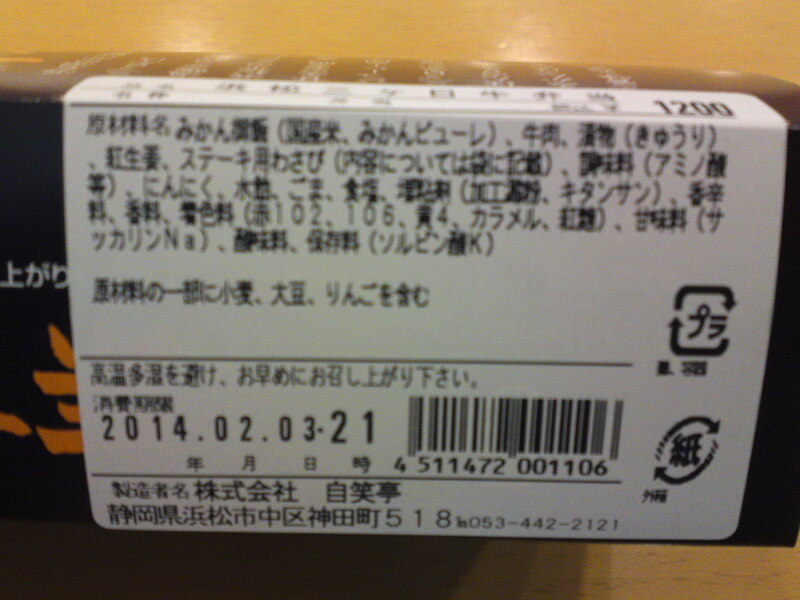 As usual Jishotei Company in Hamamatsu City give precise explanations of the contents! 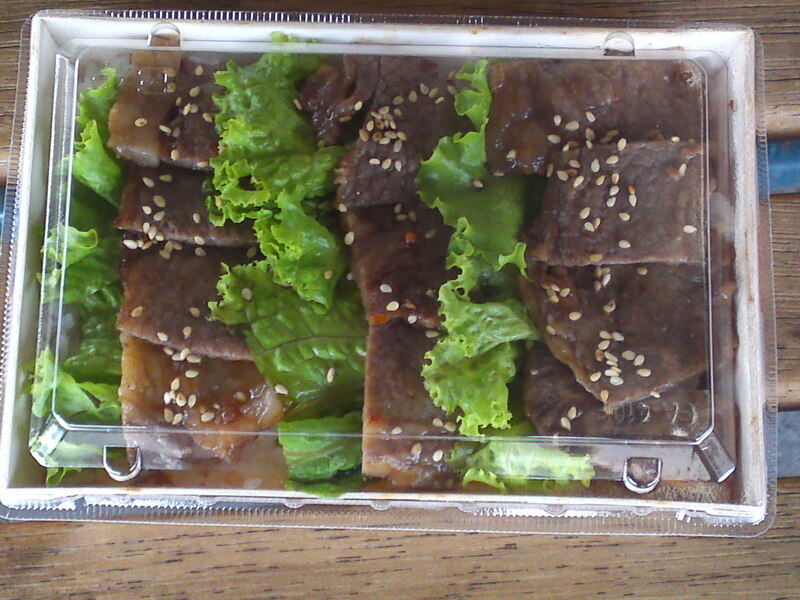 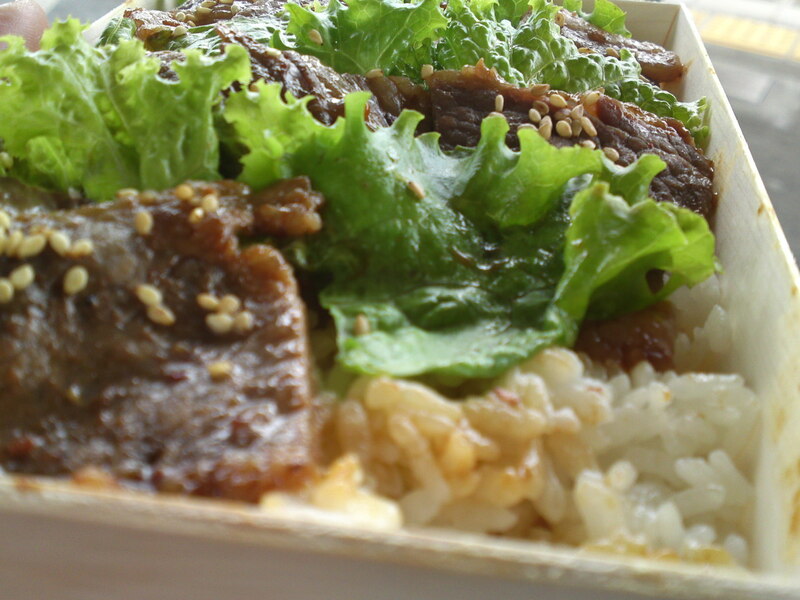 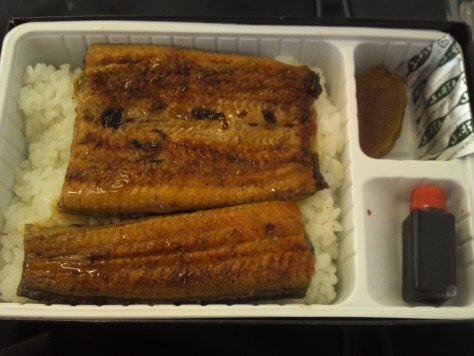 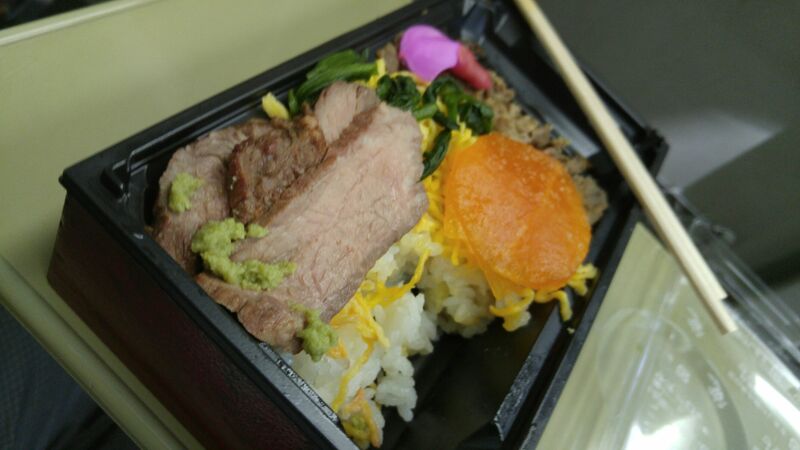 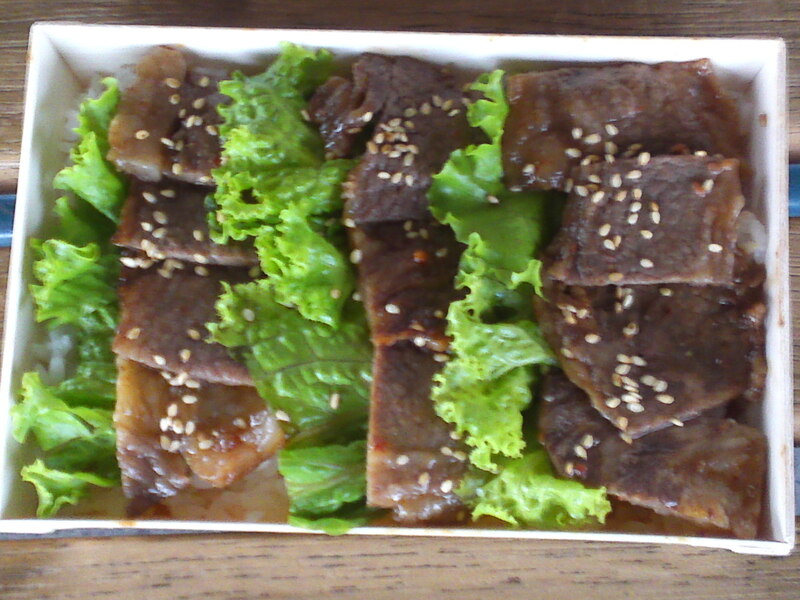 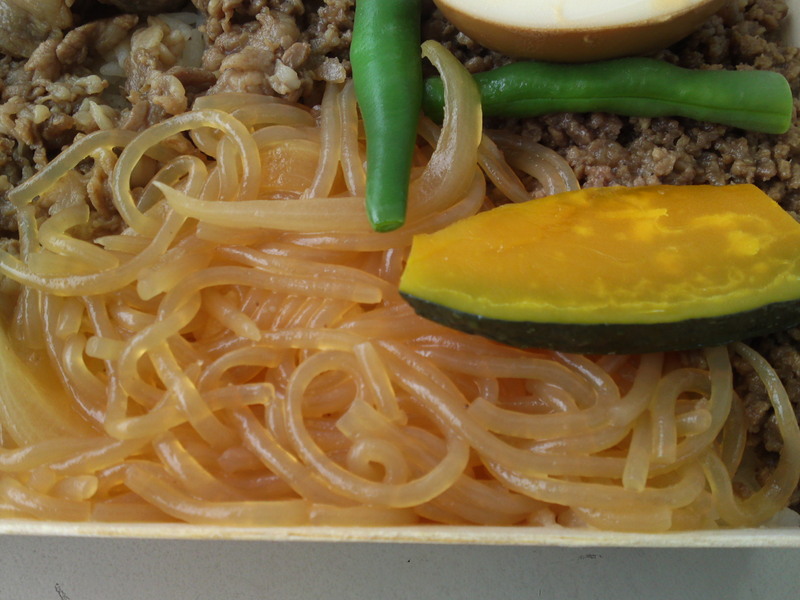 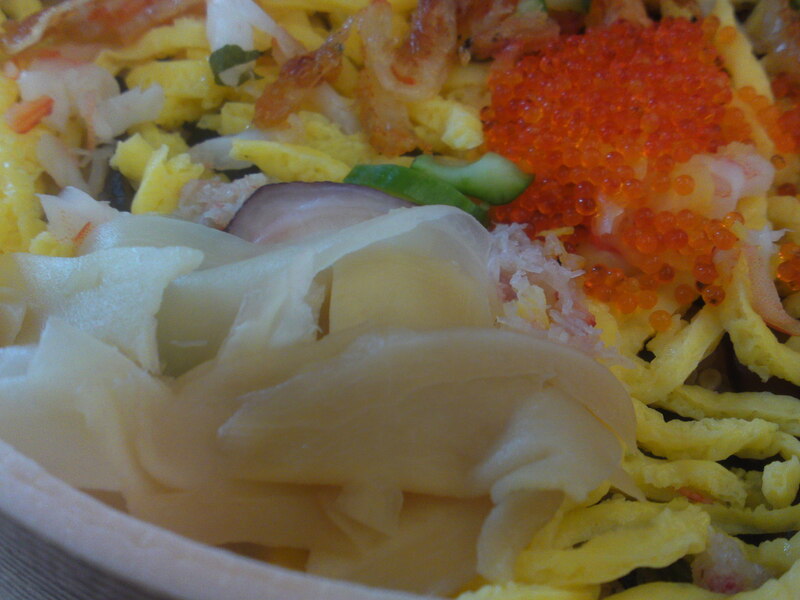 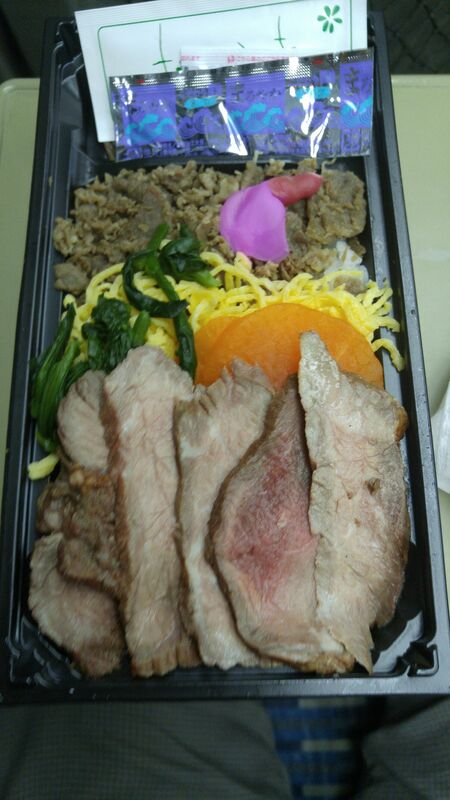 The ekiben as it looks without the sticker. 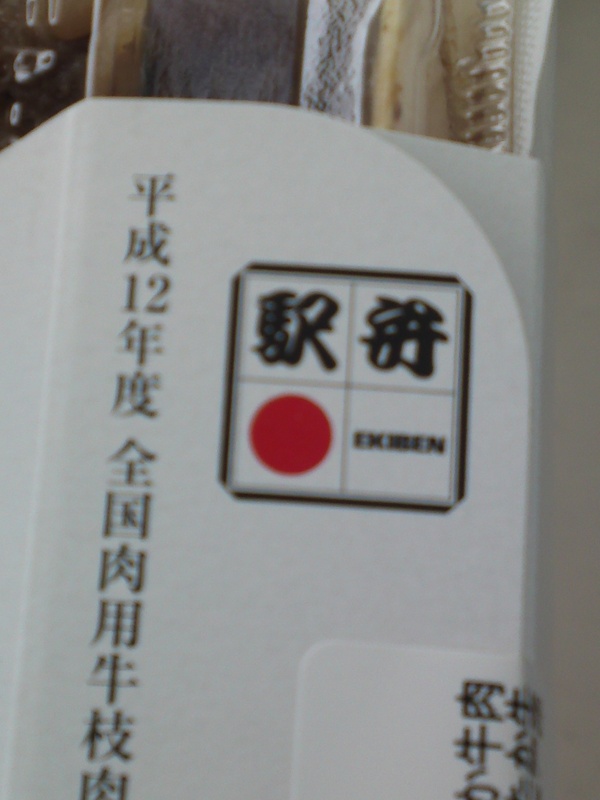 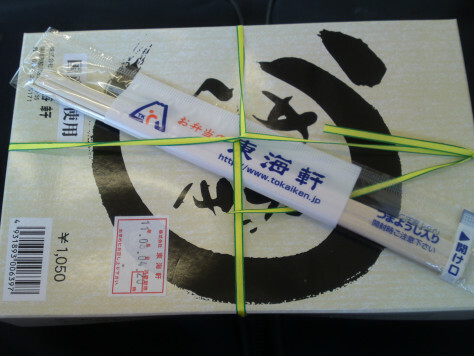 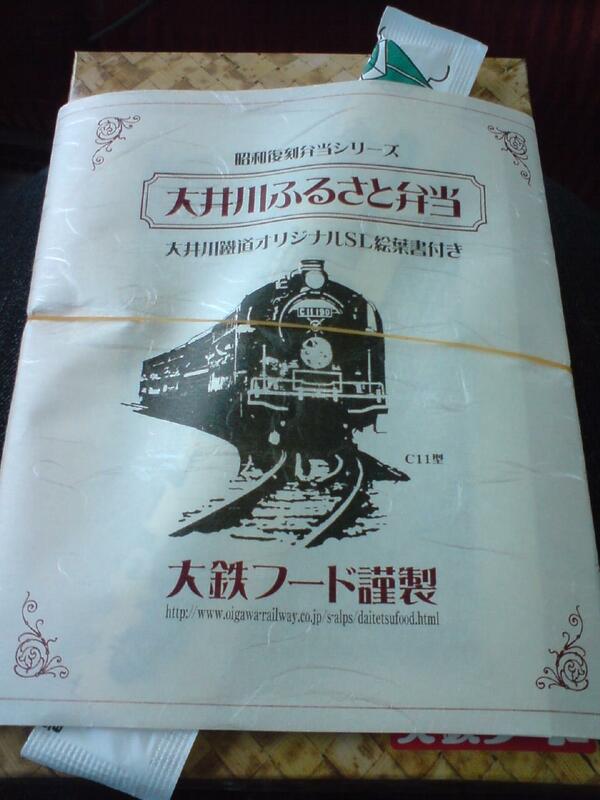 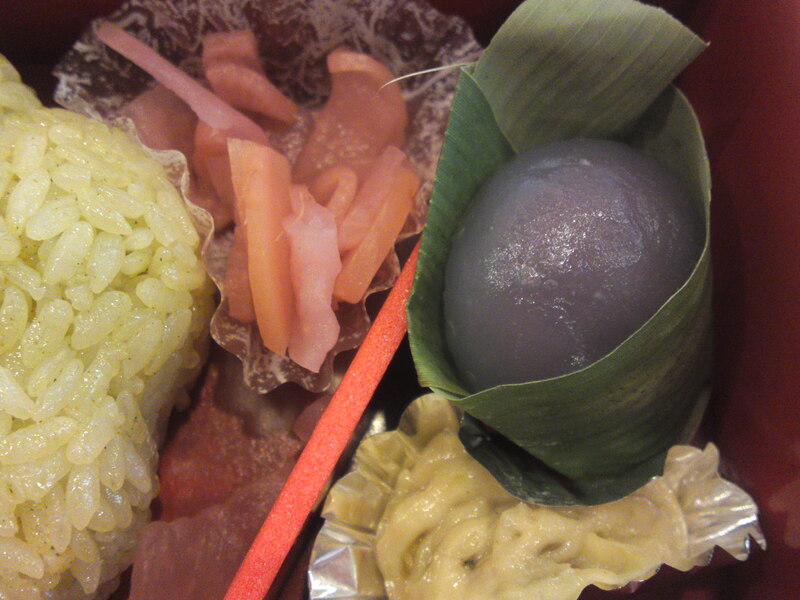 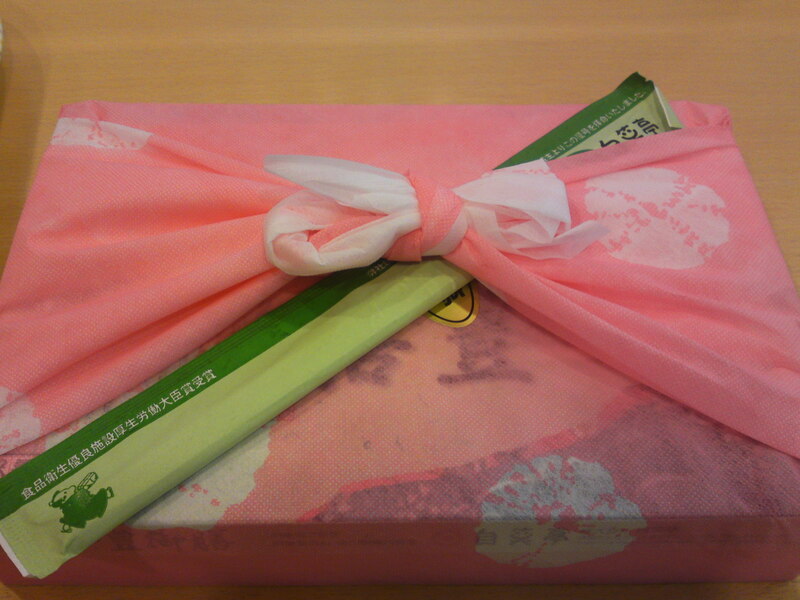 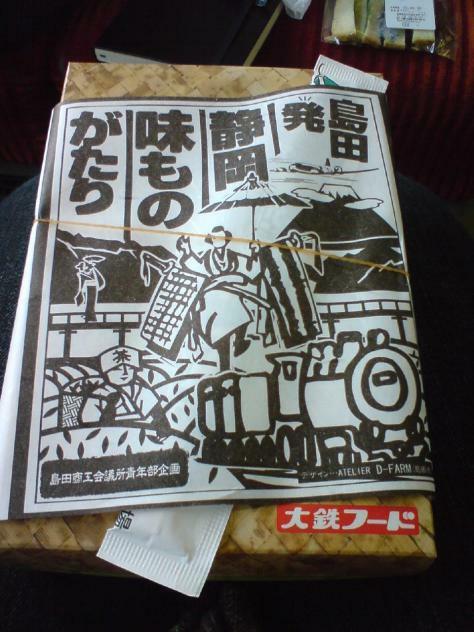 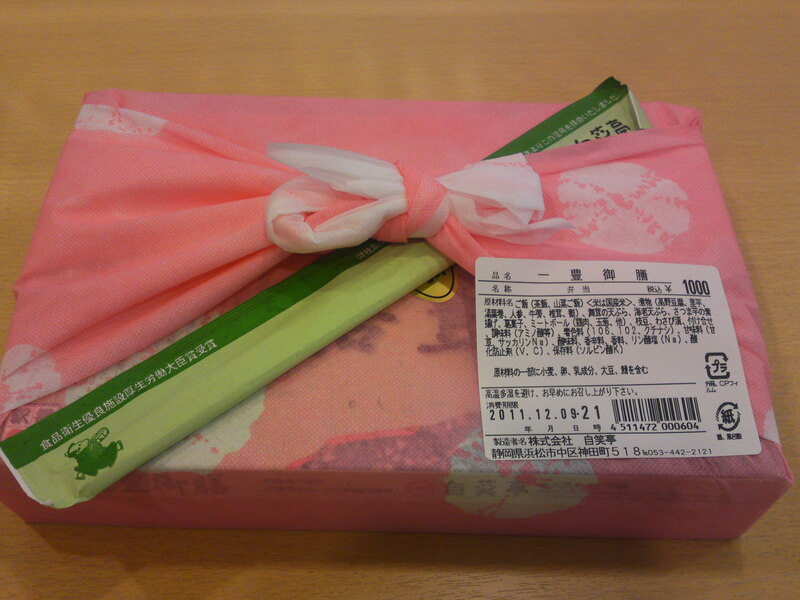 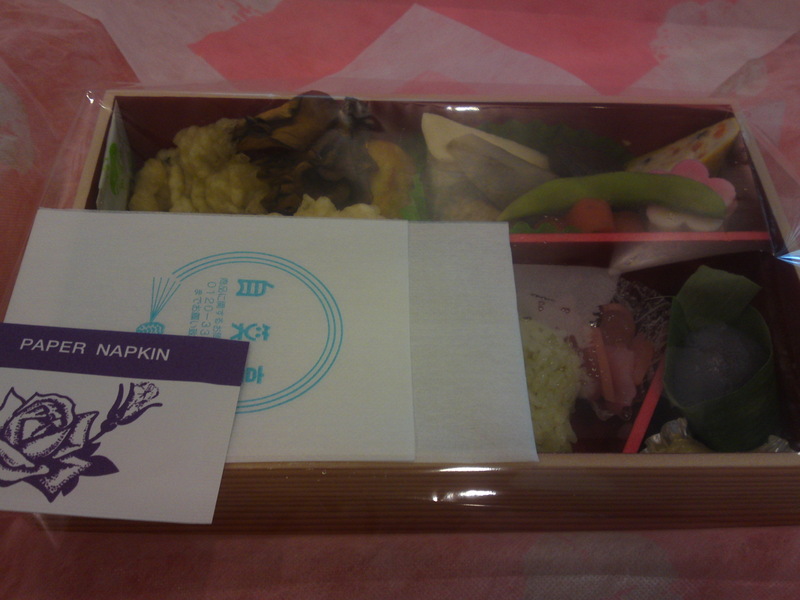 It is wrapped in very sturdy paper in the shape of a “furoshiki/bento box wrapping cloth”! 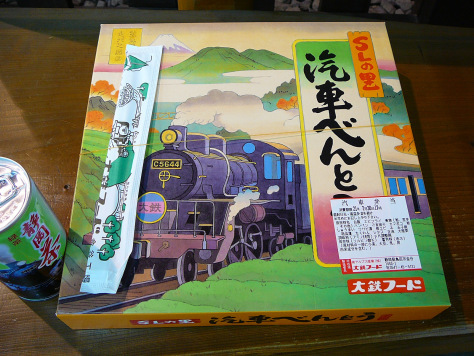 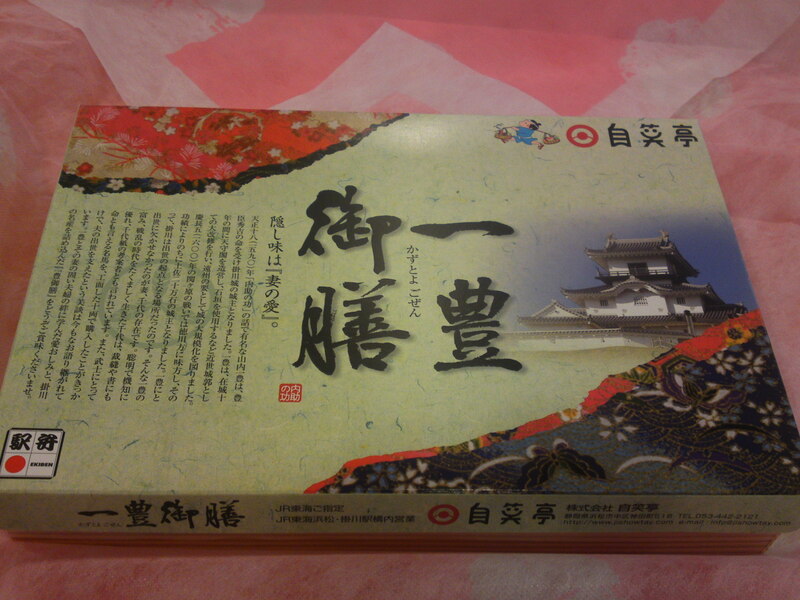 The box cover is another collector’s item with the introduction to the story of Lord Kazutoyo Yamauchi! 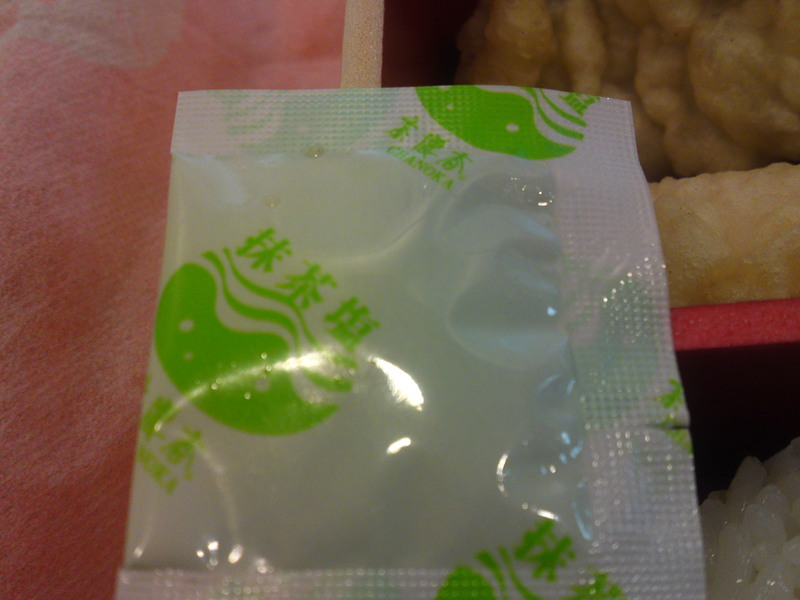 The inside was protected by a sheet of hard translucent paper and a wet towel was also provided! 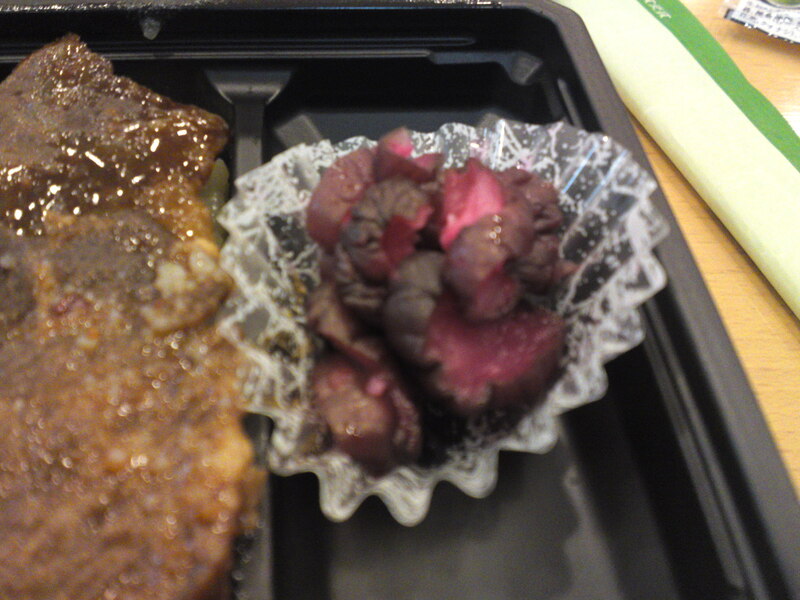 Two o-musubi/rice balls both molded into the shape of cherry blossom. 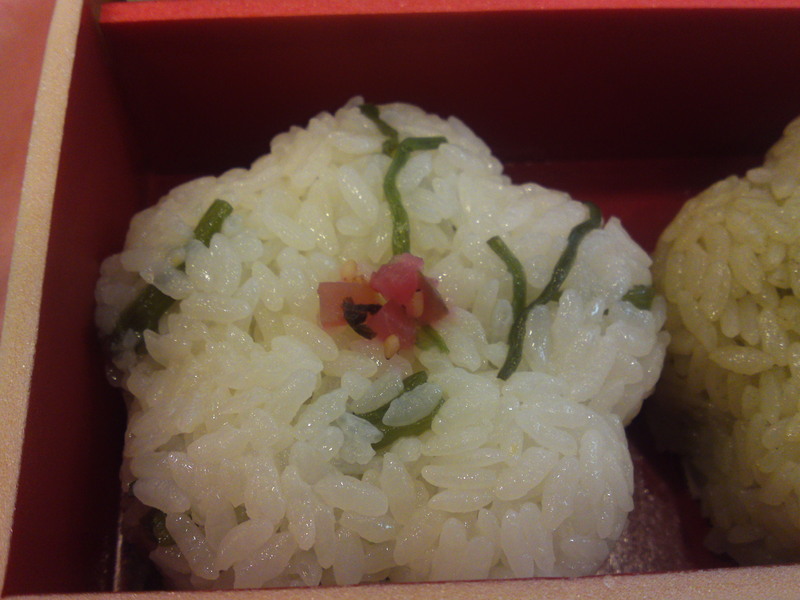 The first one is mixed with sansai/山菜/wild mountain vegetables and topped with a salted cherry blossom! 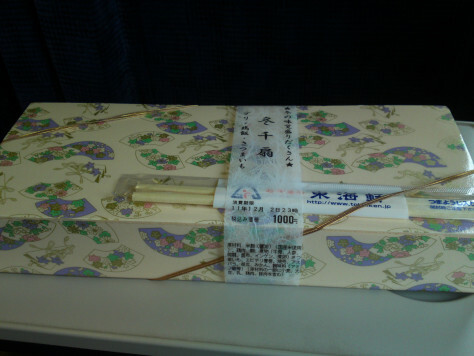 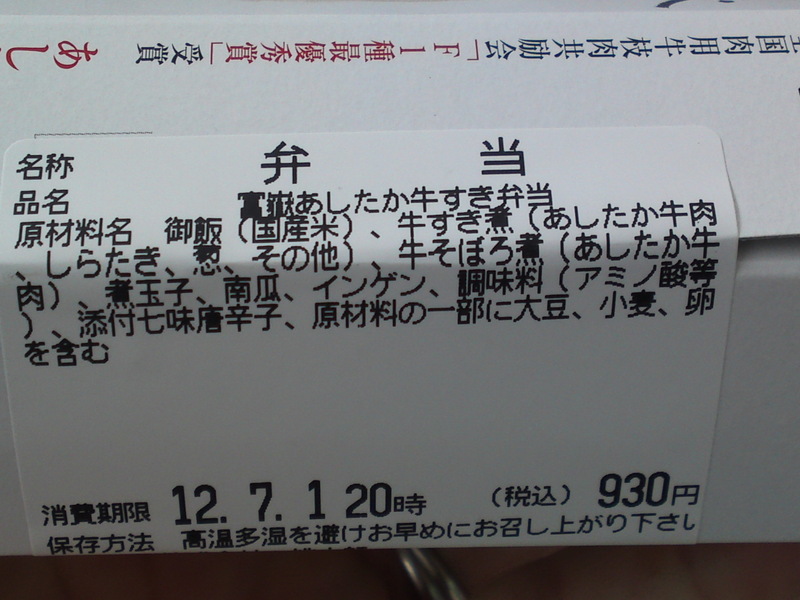 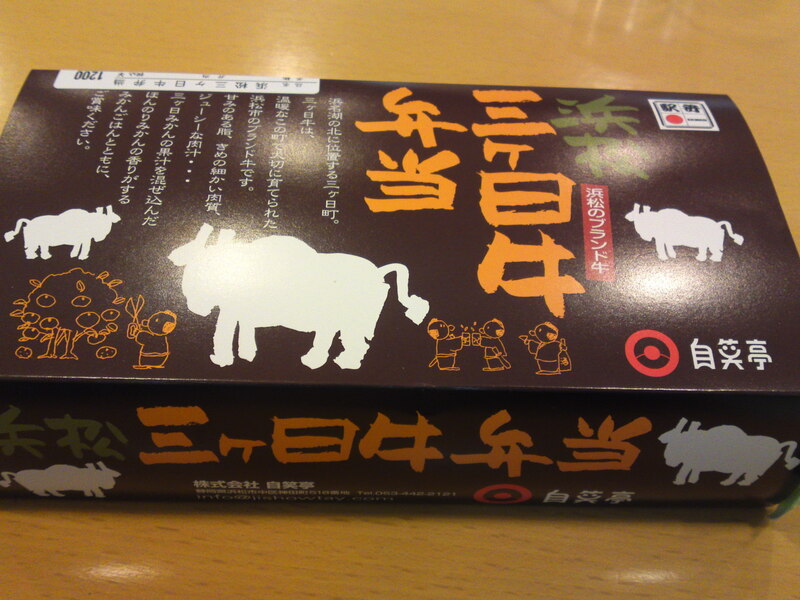 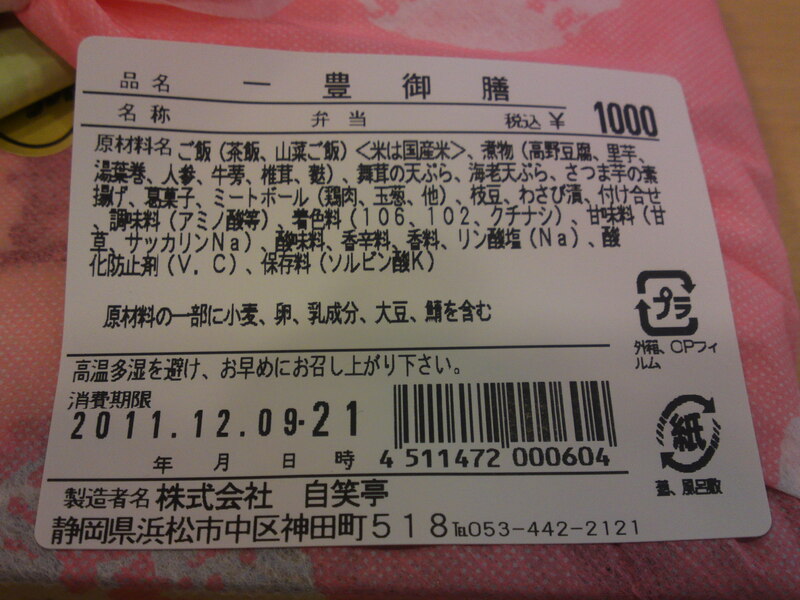 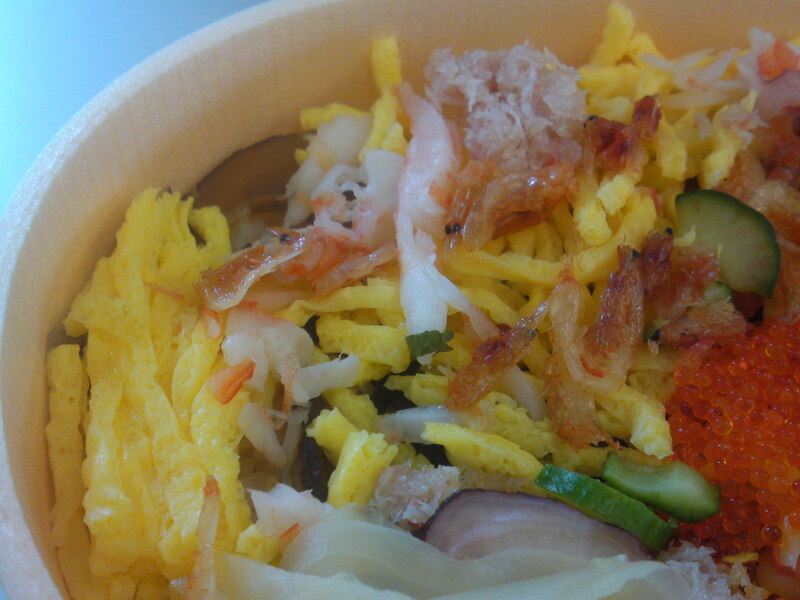 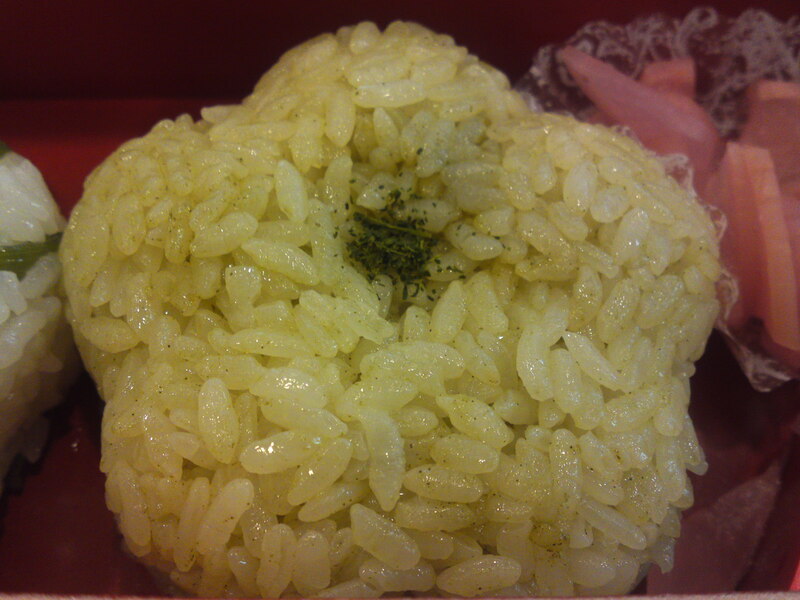 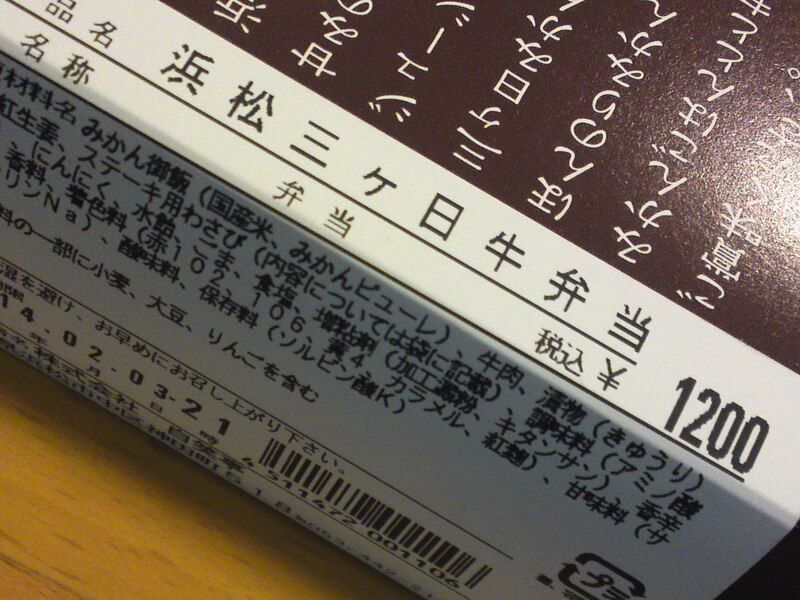 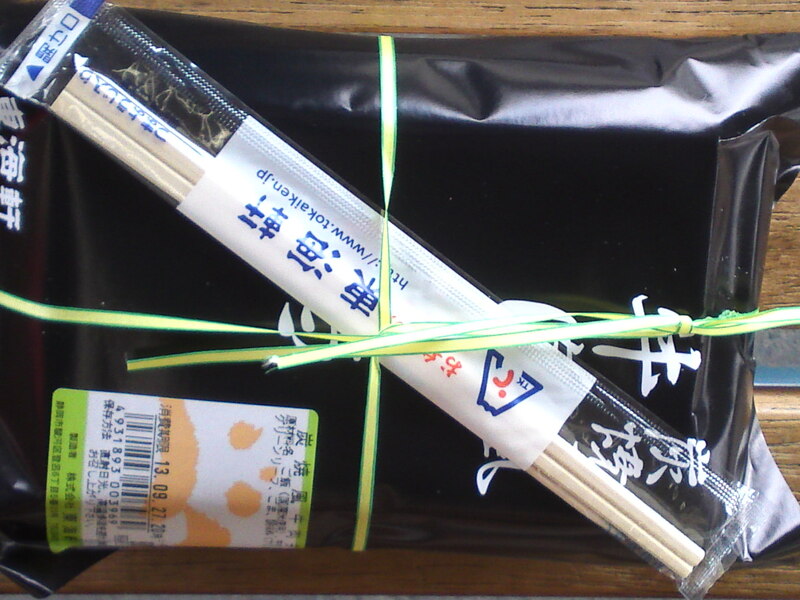 The second one consists of rice steamed into green tea from Kakegawa City! 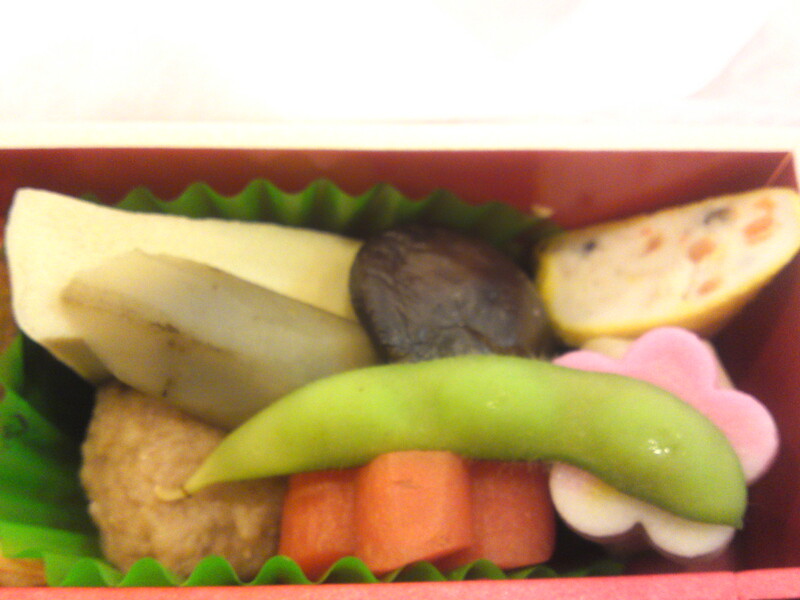 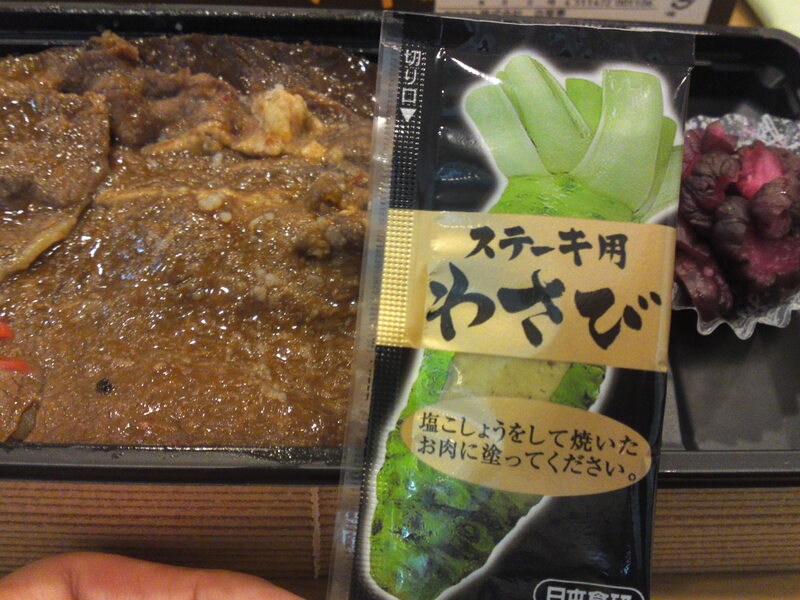 Pickles and wasabi zuke to season the rice and a wagashi/Japanese cake made of anko/sweetmeats and jelly. 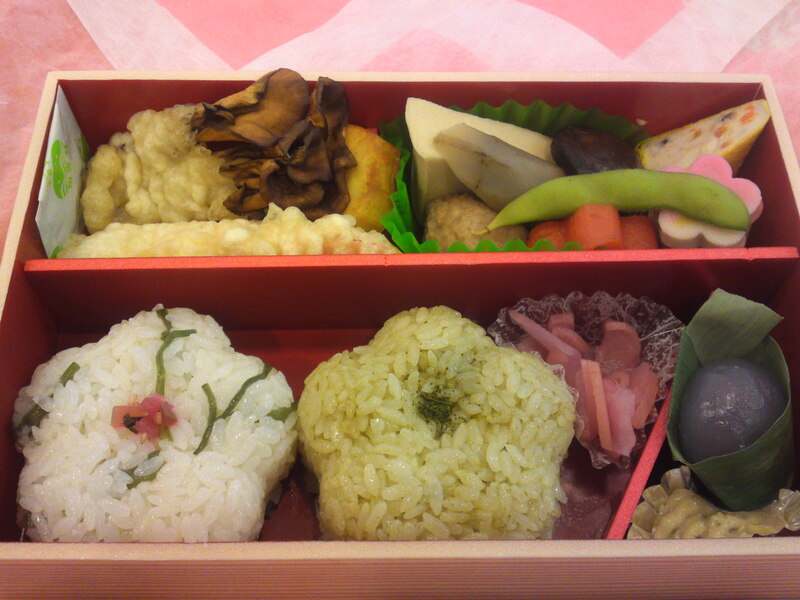 Chicken meat ball, simmered carrot, tofu flower atop a boiled sato imo/taro, boiled edamame, simmered burdock root, simmered shiitake mushroom, Takano tofu and Yuuba maki/tofu skin roll. 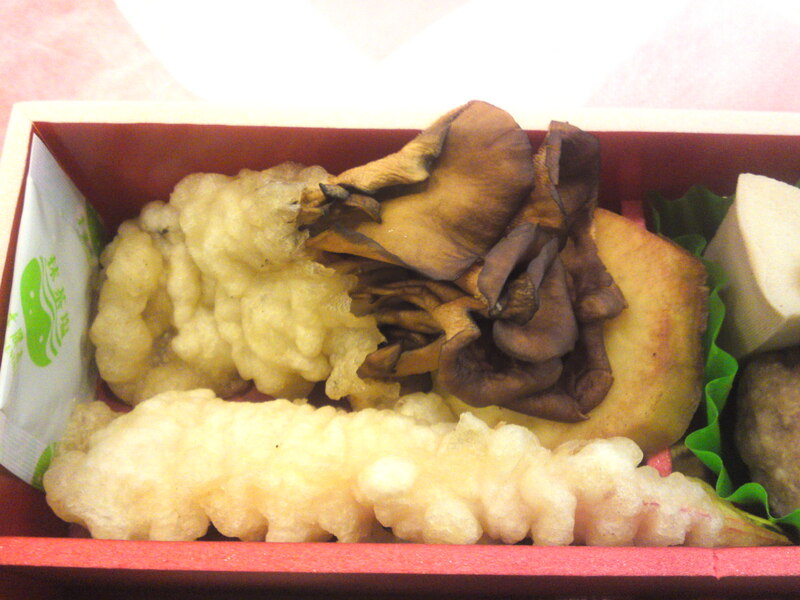 Maitake mushroom/Hen-of-the-Woods Mushroom tempura, prawn tempura and deep-fried sweet potato. 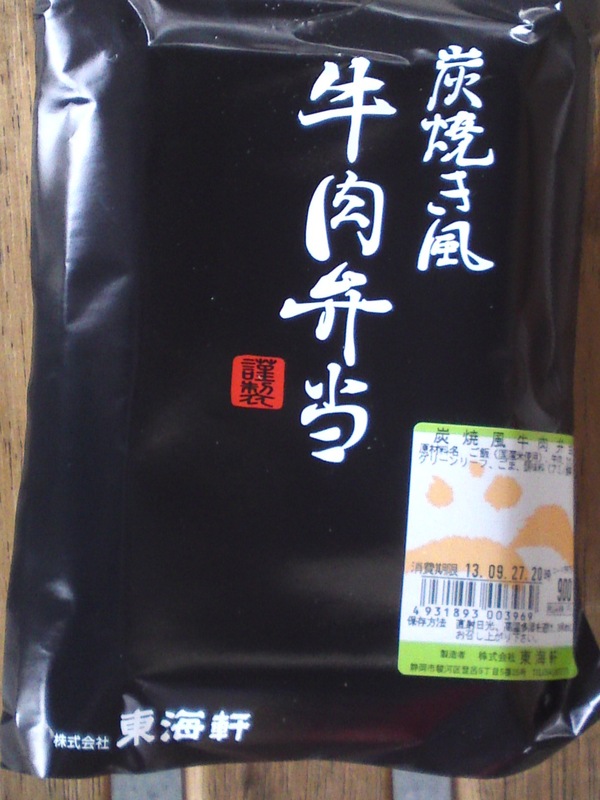 Salted matcha tea was provided to season the tempura! 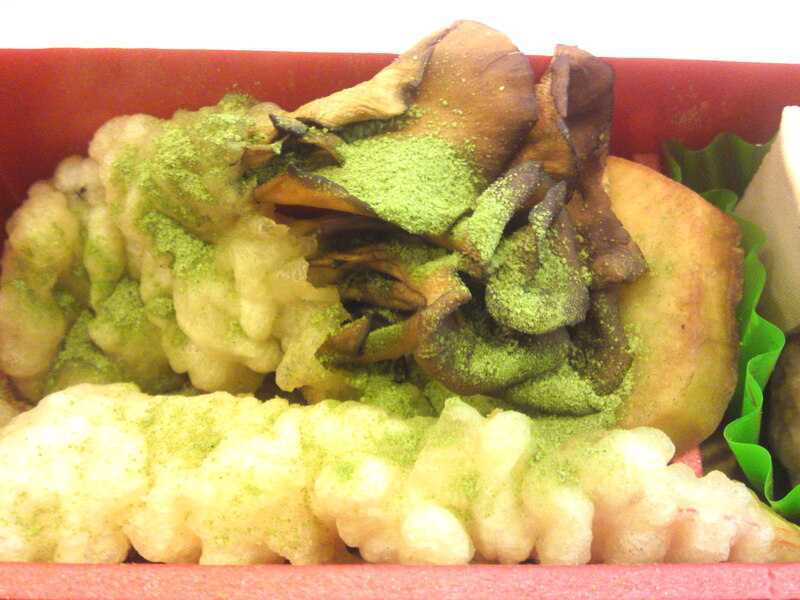 The tempura once seasoned with salted matcha tea! 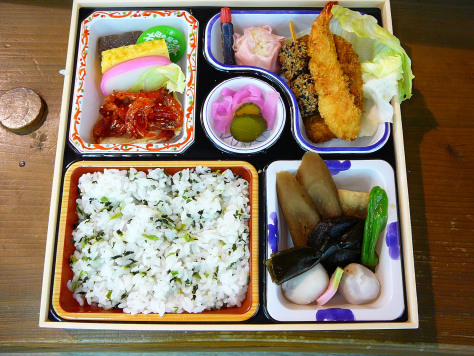 I wouldn’t mind going back to the 16th Century if people then ate like that!